The IB has certainly made an impact since it was launched in 1968. From prime ministers to astronauts, teachers to filmmakers, an IB education has developed generations of inquiring, knowledgeable and caring young people who seek to create a more peaceful world. Now, it’s time to celebrate the community’s great work. 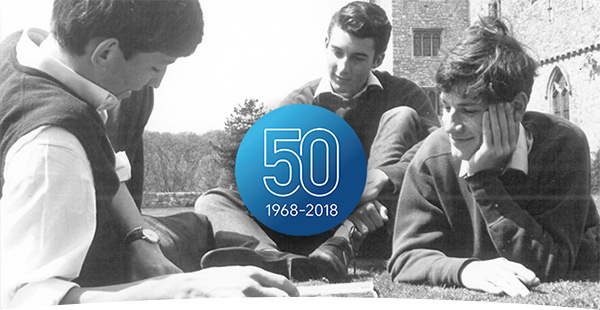 In the build-up to the IB’s 50th anniversary in 2018, we will share our greatest achievements, champion the relevance of an IB education for future generations and educate the world on what an IB education represents – increasing understanding among people and changing perceptions. In 1968, as communities recovered from the impact of two World Wars, the IB pioneered a movement for international education. The idea was to bring young people together with the skills, values, and knowledge necessary to build a more peaceful future. Our organization is succeeding in its mission. Today, in more than 4,000 schools in 159 countries, IB students and graduates use their learning to make a real impact in the communities around them. The world has become more complex and continues to change. However, an IB education encourages global engagement, open-mindedness and a commitment to lifelong learning. Future ethical leaders and creative entrepreneurs will continue to carry the beacon of hope and incite positive change for the next generation, creating more achievements for us to celebrate in another 50 years. ✓ next year’s IB Global Conferences celebrating the diverse expertise of our IB community of educators.